Close to the Bone, by Charlotte Trevella (Steele Roberts), 65pp., $19.99; Brown Girls in Bright Red Lipstick, by Courtney Sina Meredith (Beatnik Publishing), 68pp., $24.99. Close to the Bone is Charlotte Trevella’s second collection of poems published by Steele Roberts. Trevella has been building a name for herself as an emerging young poet while studying medicine in Auckland. In 2008 she was selected as one of the top fifteen youth poets in the world, and in 2009 she won the New Zealand Post National Schools Poetry Awards. sees a naked woman floating in the Avon, face-down. she comes to pieces in their arms. with its head stuck in the sandpit. what you need, and when it rains it pours. with superglue and stop your ears with gum. they’re dripping pus and plasma. and slices off her tongue. By the end of the poem where the ‘monkey … slices off her tongue’ I wonder if this is a literal monkey, a dream monkey, or if the monkey is a figurative symbol for the man’s reaction to seeing a dead woman? This confusion means that Trevella’s attempt to link (and comment on) religious teaching, nursery rhymes, cliché, and fashion loses its impact. The poem feels like a bad dream, and the problem with dreams is that nothing matters; nothing is at stake. What further confuses some poems is the inclusion of mythic imagery. For example, mermaids, gods, centaurs, and fairies appear in some poems (which also draw on old and middle English descriptions such as ‘gloaming thicket’ and ‘lyres’), which are difficult to reconcile with Trevella’s dystopia. For this form of surrealism to work, it must be more nuanced. The second issue that makes Close to the Bone a difficult collection to review is the tone of the book. Trevella’s language can sometimes be heavy and difficult to wade through, which mimics the struggles of the society she describes. It’s an effective technique, but when nothing is simple or plain spoken, it can get a little tiring. Many of the poems offer no redemption or escape from the dystopia they describe. It’s a grim picture. Some poems express anger or sneer at their characters, such as the poem “Generation Z,” and a lack of author reflection or a transformative element results in the tone being unkind. On the other hand, in a stunning poem such as ‘Rumpelstiltskin said,’ the poet reflects on the power (and inadequacy) she has as a poet, which allows the poem to speak to larger issues. The poem ‘The tourist,’ an unflinching and accomplished poem, also strikes the right balance and the purpose of the poet’s cynicism is clear. Many readers will enjoy the complexity, surrealism, and rich imagery of this collection, and there is a lot to enjoy in Trevella’s writing. 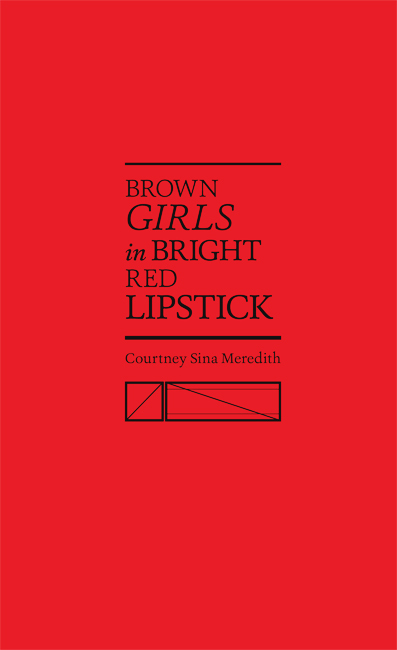 Brown Girls in Bright Red Lipstick is the debut collection by performance poet Courtney Sina Meredith, and the collection was launched at the Frankfurt book fair. Meredith has established a local and international reputation as a performer, poet, and playwright, and she is well known on the Auckland poetry circuit. Meredith has also held a writers’ residency in Berlin, and toured Indonesia for the International Poetry Festival in early 2013. The collection opens with an introduction by poet and academic Robert Sullivan who calls Meredith a ‘leader of the new generation of writers and performance artists gracing our poetry’ and ‘the brightest voice of her generation.’ While the collection is around forty five pages, so slightly shorter than the usual book of New Zealand poetry, it feels full and complete. The book itself is beautifully produced and inviting, with a red hard cover and endpaper artwork. In this era of e-books, more poetry publishers should follow Beatnik Publishing’s lead. I dive in I kiss everywhere. K Road is under water. Chicago I fly my talk! One of the pitfalls of writing about her twenties, a time of freedom and exploration, is that some of the poems feel personally encoded and inaccessible to me as a reader. Meredith’s stream of consciousness style and lack of punctuation also makes some poems hard to read on the page, and I wonder if this book would have been better produced as a CD of spoken word. As the collection does not experiment with form—which can make it seem ‘one note’ when read on paper—I wonder if hearing the poems read by the poet would bring greater differentiation. Criticisms aside, there are strong and arresting poems in this collection. For example, ‘Free hand love chat’ and ‘A good man gives his seat up on the bus’ are a pleasure to read, and the titular poem is this young poet’s voice at its best: clear, powerful, confronting, and heartfelt. SARAH JANE BARNETT is a poet and reviewer who lives in Wellington. Her first collection of poems A Man Runs Into A Woman, published by Hue and Cry Press in 2012, is a finalist in the 2013 New Zealand Post Book Awards.